Torsten Nils Wiesel (born 3 June 1924) is a Swedish neurophysiologist. Together with David H. Hubel, he received the 1981 Nobel Prize in Physiology or Medicine, for their discoveries concerning information processing in the visual system; the prize was shared with Roger W. Sperry for his independent research on the cerebral hemispheres. Wiesel was born in Uppsala, Sweden in 1924, the youngest of five children. In 1947, he began his scientific career in Carl Gustaf Bernhard's laboratory at the Karolinska Institute, where he received his medical degree in 1954. He went on to teach in the Institute's department of physiology and worked in the child psychiatry unit of the Karolinska Hospital. In 1955 he moved to the United States to work at Johns Hopkins University School of Medicine under Stephen Kuffler. Wiesel began a fellowship in ophthalmology, and in 1958 he became an assistant professor. That same year, he met David Hubel, beginning a collaboration that would last over twenty years. In 1959 Wiesel and Hubel moved to Harvard University. He became an instructor in pharmacology at Harvard Medical School, beginning a 24-year career with the university. He became professor in the new department of neurobiology in 1968 and its chair in 1971. In 1983, Wiesel joined the faculty of Rockefeller University as Vincent and Brooke Astor Professor and head of the Laboratory of Neurobiology. He was president of the university from 1991 to 1998. At Rockefeller University he remains the director of the Shelby White and Leon Levy Center for Mind, Brain and Behavior. From 2000-2009, Wiesel served as Secretary-General of the Human Frontier Science Program, an organization headquartered in Strasbourg, France, which supports international and interdisciplinary collaboration between investigators in the life sciences. Wiesel also has chaired the scientific advisory board of China's National Institute of Biological Science (NIBS) in Beijing, and co-chairs the board of governors of the Okinawa Institute of Science and Technology (OIST). He is also member of the boards of the Pew Center on Global Climate Change, the Hospital for Special Surgery, and an advisory board member of the European Brain Research Institute (EBRI). Wiesel has also served as chair of the board of the Aaron Diamond AIDS Research Center (1995–2001), president of the Society for Neuroscience (1978–1979), and the International Brain Research Organization (1998–2004). He was chair of the board of governors of the New York Academy of Sciences (2001–2006); and he was the academy's chairman and interim director in 2001-2002. The Hubel and Wiesel experiments greatly expanded the scientific knowledge of sensory processing. In one experiment, done in 1959, they inserted a microelectrode into the primary visual cortex of an anesthetized cat. They then projected patterns of light and dark on a screen in front of the cat. They found that some neurons fired rapidly when presented with lines at one angle, while others responded best to another angle. They called these neurons "simple cells." Still other neurons, which they termed "complex cells," responded best to lines of a certain angle moving in one direction. These studies showed how the visual system builds an image from simple stimuli into more complex representations. Hubel and Wiesel were awarded the Nobel Prize in 1981 for their work on ocular dominance columns in the 1960s and 1970s. By depriving kittens from using one eye, they showed that columns in the primary visual cortex receiving inputs from the other eye took over the areas that would normally receive input from the deprived eye. These kittens also did not develop areas receiving input from both eyes, a feature needed for binocular vision. Hubel and Wiesel's experiments showed that the ocular dominance develops irreversibly early in childhood development. These studies opened the door for the understanding and treatment of childhood cataracts and strabismus. They were also important in the study of cortical plasticity. Honorary degree, University of Pavia in 2006. Order of the Rising Sun, Grand Cordon, 2009 (Japan). National Medal of Science in 2005 (US). In 2001, Wiesel was nominated for a position on an advisory panel in the National Institutes of Health to advise on assisting research in developing countries. Republican Tommy Thompson, who at the time was Secretary of Health and Human Services, rejected Wiesel. In addition to Wiesel, Thompson's office rejected another 18 (out of 26) nominations and in return recommended other scientists that whistleblower Gerald Keusch described in an interview as "lightweights" with "no scientific credibility". When Wiesel's name was rejected, an official in Thompson's office told Keusch that Wiesel had "signed too many full-page letters in The New York Times critical of President Bush." This incident was cited by the advocacy group Union of Concerned Scientists as part of a report detailing their allegations of abuse of science under President George W. Bush's administration. Wiesel was among the eight 2005 recipients of the National Medal of Science. In 2006, he was awarded the Ramon Y Cajal Gold Medal from the Spanish National Research Council (CSIC - Consejo Superior de Investigaciones Cientificas). In 2007, both Wiesel and Hubel were awarded the Marshall M. Parks, MD Medal from The Children's Eye Foundation. Wiesel is married to Lizette Mususa Reyes (m. 2008). Wiesel was married to Teeri Stenhammar from 1956-1970, Ann Yee from 1973-1981, and author and editor Jean Stein from 1995-2007. His daughter Sara Elisabeth was born in 1975. Wiesel has done much work as a global human rights advocate. He served for 10 years (1994–2004) as chair of the Committee of Human Rights of the National Academies of Science in the U.S.A., as well as the International Human Rights Network of Academies and Scholarly Societies. He was awarded the David Rall Medal from the Institute of Medicine in 2005, in recognition of this important work. In 2009, Wiesel was awarded the Grand Cordon Order of the Rising Sun Medal in Japan. He is a founding member of the Israeli-Palestinian Science Organization, a nongovernmental nonprofit established in 2004 to support collaborative research between scientists in Israel and Palestine. 1 2 Hubel, David; Wiesel, Torsten (2012). "David Hubel and Torsten Wiesel". Neuron. 75 (2): 182–184. doi:10.1016/j.neuron.2012.07.002. ISSN 0896-6273. PMID 22841302. 1 2 "Professor Torsten Wiesel ForMemRS". London: Royal Society. Archived from the original on 2015-11-11. 1 2 "Fellowship of the Royal Society 1660-2015". London: Royal Society. Archived from the original on 2015-07-15. 1 2 3 4 5 6 7 8 9 10 11 12 13 14 15 "Torsten N. Wiesel - Biographical". Nobelprize.org. Archived from the original on 2015-07-09. Retrieved 2015-09-06. ↑ Shatz, C. J. (2013). "David Hunter Hubel (1926–2013) Neuroscientist who helped to reveal how the brain processes visual information". Nature. 502 (7473): 625. doi:10.1038/502625a. PMID 24172972. ↑ Hubel, D. H.; Wiesel, T. N. (1959). "Receptive fields of single neurones in the cat's striate cortex". The Journal of Physiology. 148 (3): 574–591. doi:10.1113/jphysiol.1959.sp006308. ISSN 0022-3751. PMC 1363130 . PMID 14403679. ↑ Hubel, D. H.; Wiesel, T. N. (1962). "Receptive fields, binocular interaction and functional architecture in the cat's visual cortex". The Journal of Physiology. 160 (1): 106–154. doi:10.1113/jphysiol.1962.sp006837. ISSN 0022-3751. PMC 1359523 . PMID 14449617. ↑ Voneida, T. J. (1997). "Roger Wolcott Sperry. 20 August 1913--17 April 1994: Elected For.Mem.R.S. 1976". Biographical Memoirs of Fellows of the Royal Society. 43: 463–470. doi:10.1098/rsbm.1997.0025. ↑ Berlucchi, Giovanni (2006). 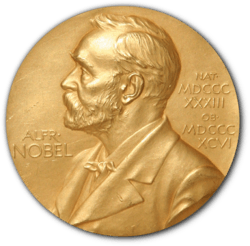 "Revisiting the 1981 Nobel Prize to Roger Sperry, David Hubel, and Torsten Wiesel on the occasion of the centennial of the Prize to Golgi and Cajal.". Journal of the history of the neurosciences. 15 (4) (published Dec 2006). pp. 369–75. doi:10.1080/09647040600639013. PMID 16997764. ↑ Shampo, M A; Kyle, R A (1994). "Torsten Wiesel--Swedish neurobiologist wins Nobel Prize.". Mayo Clin. Proc. 69 (11) (published Nov 1994). p. 1026. doi:10.1016/s0025-6196(12)61367-6. PMID 7967753. ↑ Korczyn, A (1981). "[Nobel prize winners in medicine--1981 (Torsten Wiesel, David Hubel)]". Harefuah. 101 (12) (published Dec 15, 1981). pp. 378–9. PMID 7042494. ↑ Prasanna, Venkhatesh V (2011). "Do we learn to see?". Resonance: Journal of Science Education. 16 (1) (published Jan 12, 2011). pp. 88–99. doi:10.1007/s12045-011-0013-4. ↑ Angier, Natalie. "Acting President of Rockefeller U. to Stay at Least 3 More Years," New York Times. February 21, 1992; Sengupta, Somini. "Princeton Cancer Expert Is New Rockefeller U. President," New York Times. July 1, 1998. ↑ http://www.ebri.it/DOCUMENTO/672/en/go.aspx Archived January 4, 2010, at the Wayback Machine. ↑ Overbye, Dennis. "New York Academy of Sciences Elects a New Chief Executive," New York Times. November 19, 2002. 1 2 Goldstein, B. (2001). Sensation and Perception (6th ed.). Wadsworth. 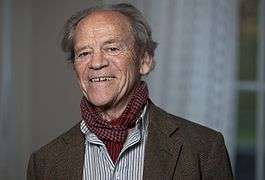 ↑ "The Royal Swedish Academy of Sciences: Torsten Wiesel". Retrieved 2009-05-01. ↑ Japanese Ministry of Foreign Affairs, "2009 Autumn Conferment of Decorations on Foreign Nationals," p. 1. ↑ "David Rall Award Recipients". iom.nationalacademies.org. Retrieved 21 October 2015. 1 2 National Eye Institute: "NEI Grantees Receive National Medals of Science," 2007. ↑ Emma Marris (14 July 2004). "Bush accused of trying to foist favourites on health agency". Nature. 430 (281): 281–281. doi:10.1038/430281a. PMID 15254502. ↑ Seth Shulman (2007). Undermining Science: Suppression and Distortion in the Bush Administration. University of California Press.